If you have ever ventured into the hazardous territory of, “Okay, kids screen time is over,” you know the resistance that is often felt when parents try to set boundaries on screen time. One of the biggest issues with cutting back on screen time is that parents will often limit the screen time without suggesting what to do instead. The natural response from most children will be, “I’m bored!” One solution is to have certain family activities or projects already in place which children will happily make the switch too. I’ve been pleasantly surprised to find that when I suggest to my own children, “Hey, you want to take a walk with me?” screens are quickly tossed, and shoes are dug out from under couches. The truth is our children don’t really mind putting those screens down if there is the anticipation of something better. Better does not mean more expensive, or even necessarily more entertaining. Better, to most children, means more engaging. They like to have their senses engaged. The more senses that they can have engaged in an activity the better they like it. Because screens only engage the senses of sight and hearing, it is not really that difficult to find activities that are more engaging. Gardening is one such activity which can engage almost all of our senses at once. If you are growing items you can eat later, then you have the entire sensory package in one great activity which, bonus, also gets the family outside and moving. Very few children will pass up the opportunity to go outside with Mom or Dad and play in the dirt for a while. If you think your kids will not respond well to, “Hey, kids we are going to start cutting back your screen time and get you gardening instead,” well, you are exactly right. Sometimes you have to go around to the back door with kids and basically trick them into doing what they need to do. A much better approach is to silently, and sneakily prepare a gardening project by yourself. 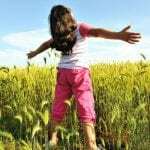 Then, when your kids least expect it, ask them to come help you “move some dirt,” or, “dig a hole.” Few children can resist either of these phrases. If you don’t think that will work, then get outside, get your own hands in the dirt, find a couple of worms, and then excitedly invite your kids to come see what you found. Once they are outside and their hands are in the dirt, the rest pretty much happens naturally. You can start by inviting them to dig with you, move plants, count seeds. Explain to them what will grow from the seeds, ask them to fill up water jugs for watering. 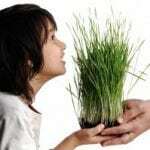 Give them a plant, which is their own special plant to take care of and watch grow. Once you have them outside with their hands in the dirt, engage, engage, engage. Get them talking, moving and laughing and the screens will naturally be forgotten. Kids will always pass up something less fun, for something more fun. I have actually heard people say before, “Oh, I don’t garden because it’s expensive.” Compared to the expense of most of the stuff we do to entertain our children, gardening is really cheap. The truth is, you can make gardening as cheap or as expensive as you want. If you are already a regular gardener, then you likely have plenty of supplies on hand to get your kids off their screens and working on a gardening project together. If not, then use the “Movie Night Rule.” The Movie Night Rule is this: add up how much you and your entire family would spend on a night at the movie theater. Movie theaters are a hugely overpriced activity, which millions of families gladly splurge on regularly. Skip a trip to the theater and use the money to start your project. FYI, this rule can help you get just about any project around your home started. Don’t over think the project at first. It can be as simple as digging up a spot of ground and planting a $1.00 box of wildflower seeds for butterflies. If you want to get fancy and have the money, go for it. Start a raised bed vegetable garden with enough plants to feed your whole family through the summer. The point is, do what you can. Start somewhere, even if you start small. 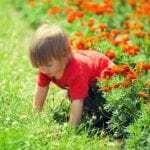 Establish gardening as a new pastime, something your kids can look forward to. If this is your first-time gardening with kids, then take out your little spade shovel, dig a nice deep hole and bury your perfectionism. 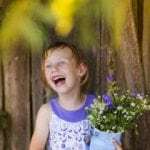 These types of gardening projects are not about landscaping your yard, growing a victory vegetable garden, or posing your children and their plants into Pinterest perfect photos. Stop! Expect messy, chaos. Expect an extra-long bath time afterward. Expect scrubbing under your kids’ fingernails. But also expect some great memories, expect to hear your kids still talking about it hours later. Expect maybe one of your kids really getting into gardening later on. 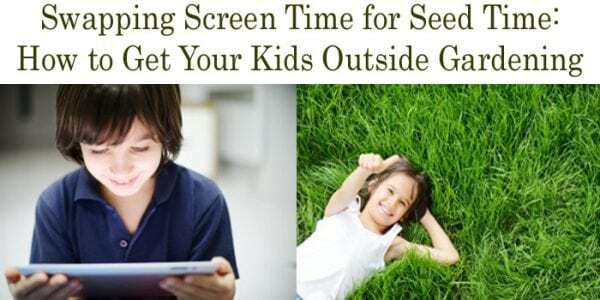 Expect how great you’ll feel knowing that you successfully got your kids off their screens, outside in the sunshine and playing together as a family!